To honor and promote the image of Halong Bay, on 16th August, Quang Ninh province's Literature and Arts Association in cooperation with Halong Bay management board opened the camp for the creativity of souvenirs about Halong bay. All individuals and groups living and working in Vietnam can participate. works are drawings or designs in any material, particularly encourage the use of the material characteristics of Quang Ninh, Halong sea and environmentally friendly materials. Contest results will be announced in mid-October, in time to organize activities to celebrate the 20th anniversary of Halong Bay was recognized as a World Natural Heritage Site - Halong bay travel. 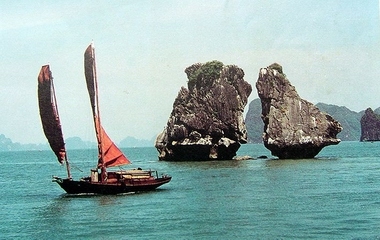 Do Duc Thang, deputy head of the Ha Long Bay Management Board, Head of the contest organizing committee said with the theme reflecting characteristics and originality of the World Natural Heritage, the contest aims to select the souvenir products with beaufiful appearance, featuring evident characteristics, development strategy, attractiveness and advantages of the bay; honor, promote the image of Ha Long Bay sights, stimulate the creative potential of organizations and individuals to create souvenir products to serve the management, conservation and promotion of the values of Ha Long Bay, as well as producing gifts for shopping needs of the visitors.